I looked around on the internet to find what was already out there and then tweaked it to my liking. I got most of my inspiration from Larissa at Just Another Day in Paradise. I started by downloading some Harry Potter looking fonts. You can find quite a few here. My favorites were Harry P, Lumos, and Hogwarts Wizard. Update: I'm finding out newer versions of Microsoft Word don't have Viner Hand ITC, which is what I used for the main font in the letter. Instead, I'm now using Golden Script available for download for free here. I used this envelope template. I included a Owl Post stamp that I got from here. I was going to post a file with the editable version of the envelope. I haven't figured out a good way to do it, though, because Google Drive doesn't recognized the fonts I used...so if you'd like the editable version of the envelope, so you can just fill in the kids' names, email me and I'll send it to you. You'll need those fonts installed on your computer for the invite to work. 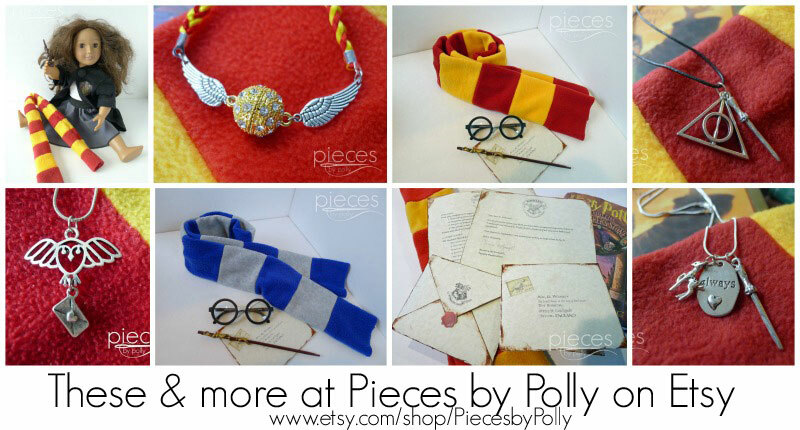 ***(Jan 2014) Due to popular demand, I now carry these in my shop....Pieces by Polly on Etsy, along with quite a few other Harry Potter Gift Items in case you don't feel up to printing off the letter and putting all the special touches on it. 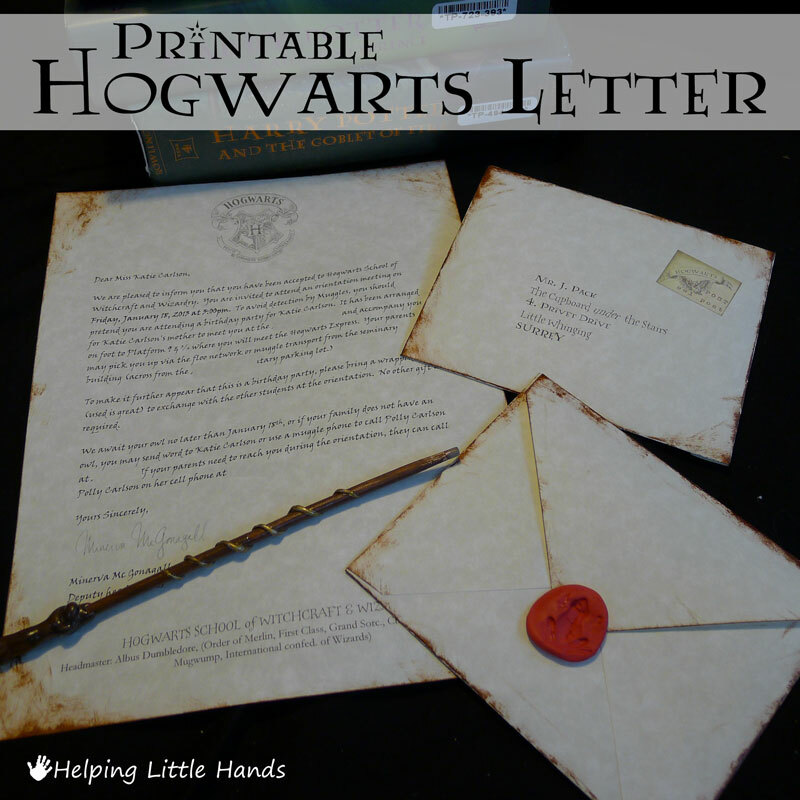 For the inside of the letter, I made my own Hogwarts letterhead by putting a Hogwarts crest at the top. I used Viner Hand ITC (a standard font you probably already have in Word) for the body font. It looks kind of old-style, but is easier to read in small type than the Harry Potter fonts are. I found an image of Professor McGonagall's signature and included that. Again, if you email me, I'm happy to send you the file for you edit with your own invitation information. I printed the envelopes and the letter out on parchment paper...which is kinda spendy. If you're trying to do this cheaper, you could just use cream colored paper or cardstock. I used a brown stamp pad to make the edges look distressed/aged. Then I sealed them with a wad of red Fimo clay. 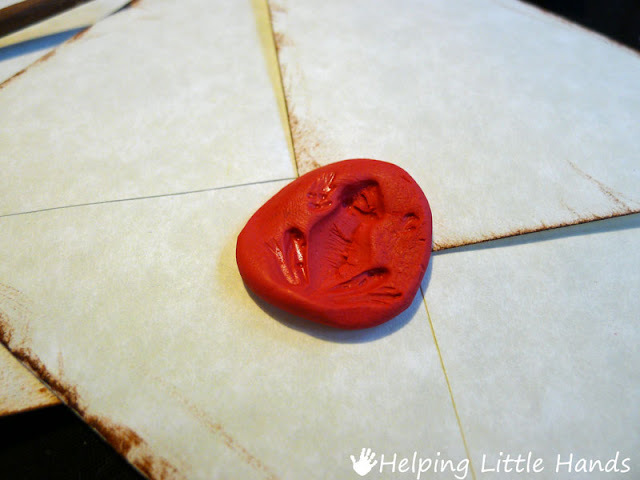 I actually found the clay is not so great as a sealer itself, so I suggest a bit of glue stick or tape to hold the envelope shut and then put the clay on for decoration. I tried a couple of things to make a fun looking seal and ended up using an old frog shaped earring I had. To be more authentic, you'd want an H shape. I found printable Hogwarts Express Tickets here. I ended up giving mine to the kids as soon as the party started, but I wish I'd thought to put them in their invitations. There are two options there. I printed one off and then saw the other one and liked it better. Once printed, I couldn't decided which I liked better. 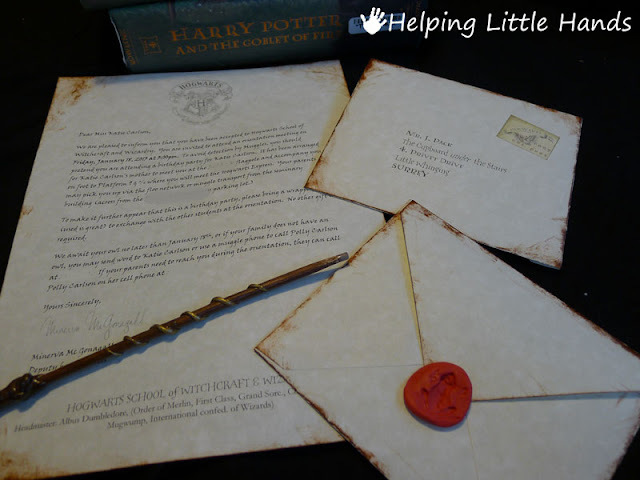 I've also seen several fun ideas to deliver the invites with a stuffed owl or an owl drawn on a balloon. We didn't have a stuffed owl though, and I figured the owl balloon would be too disruptive since my daughter delivered most of them at school. We only sent one through the US Postal Service and we put that one inside another envelope to protect the seal. We are pleased to inform you that you have been accepted to Hogwarts School of Witchcraft and Wizardry. You are invited to attend an orientation meeting on Date at Time. 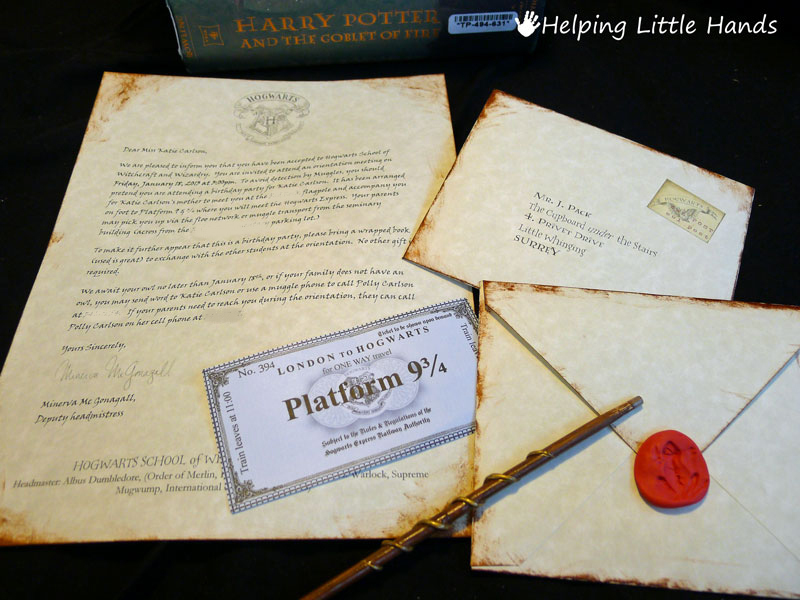 To avoid detection by Muggles, you should pretend you are attending a birthday party for Katie. 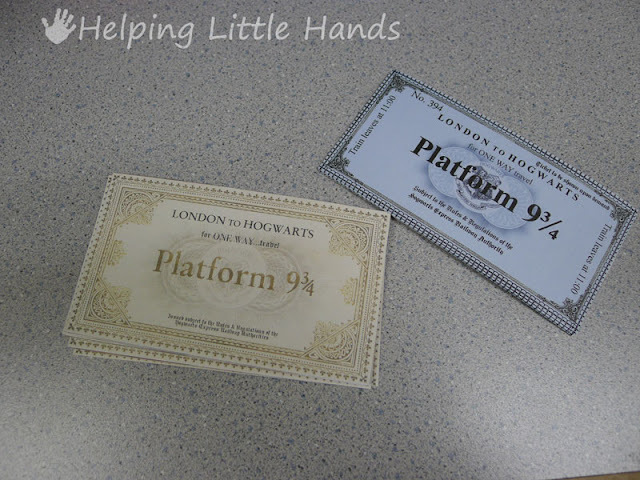 It has been arranged for Katie Carlson's mother to meet you at _____________ and accompany you on foot to Platform 9 & ¾ where you will meet the Hogwarts Express. Your parents may pick you up via the floo network or muggle transport from ___________________. To make it further appear that this is a birthday party, please bring a wrapped book (used is great) to exchange with the other students at the orientation. No other gift is required. We await your owl no later than January 18th, or if your family does not have an owl, you may send word to _______ or use a muggle phone to call Polly at ________. If your parents need to reach you during the orientation, they can call __________. Everything looks awesome. I went and checked out the party overview too. That Sorting Hat was insane!!! I am regretting that I didn't do one. I also love your quidditch ball. Genius I tell you, genius!! How fun! I'm a huge Harry Potter fan! I bet your daughter loved her party. :) New FB follower. Visiting from The Girl Creative. This is great! Mind telling me your email so you can send it to me? How did you make the brick wall? I found a brick colored queen sized sheet at the thrift store. Then I used a can of white spray paint to make the lines. I just did it freehand because I was in a hurry. I cut the slit up the middle and zigzagged the edge because we might want to use it outdoors in the future. do you still have everything for those letters and Hogwarts Express tickets? It would be so kind of you if you wanted to e-mail it all to me? Or is that too difficult? Anyway, I love your ideas! I really want to give these for my best friend her birthday! 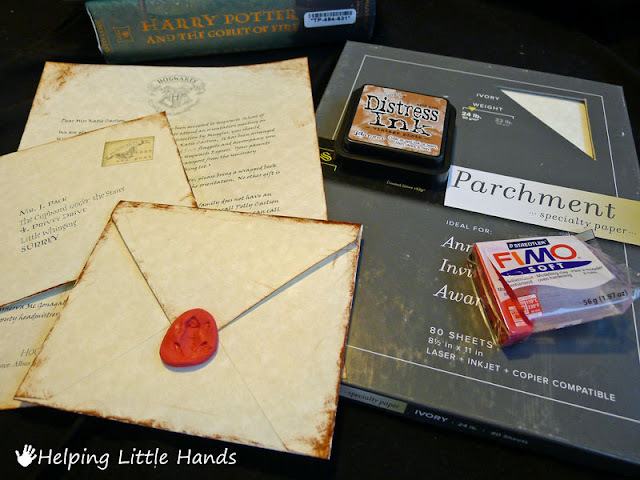 This invitation and envelope look great! Could you please e-mail me the templates?